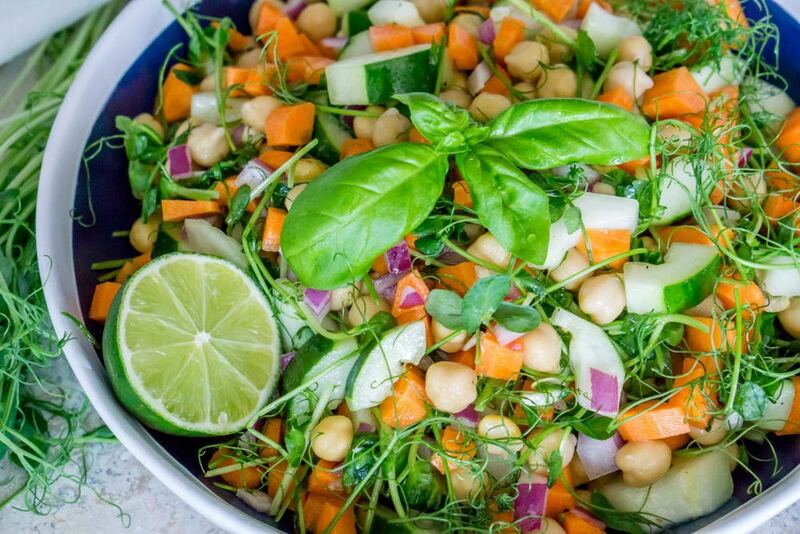 An easy, tasty salad made with chickpeas, crunchy carrots, crisp cucumbers, and lovely pea shoots, dressed with a light and flavorful vinaigrette. Prepare the dressing: in a small bowl, combine the chopped basil leaves and minced garlic. Add the lime juice and apple cider vinegar. Add the olive oil, salt, sugar, and pepper. Allow to sit while preparing the salad. In a large bowl combine the chickpeas, diced cucumber, diced carrots, and diced red onion. Add the dressing and stir well. Add the pea shoots and stir again. Serve immediately or chill in the refrigerator up to 24 hours before serving. Garnish with fresh basil leaves.